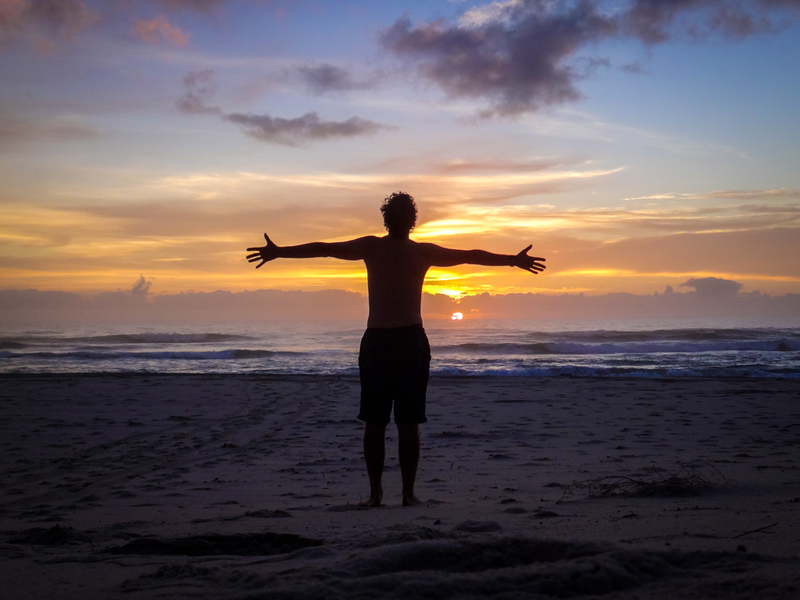 For at least one morning every year, for the rest of my life, I would like to wake up on a beach. 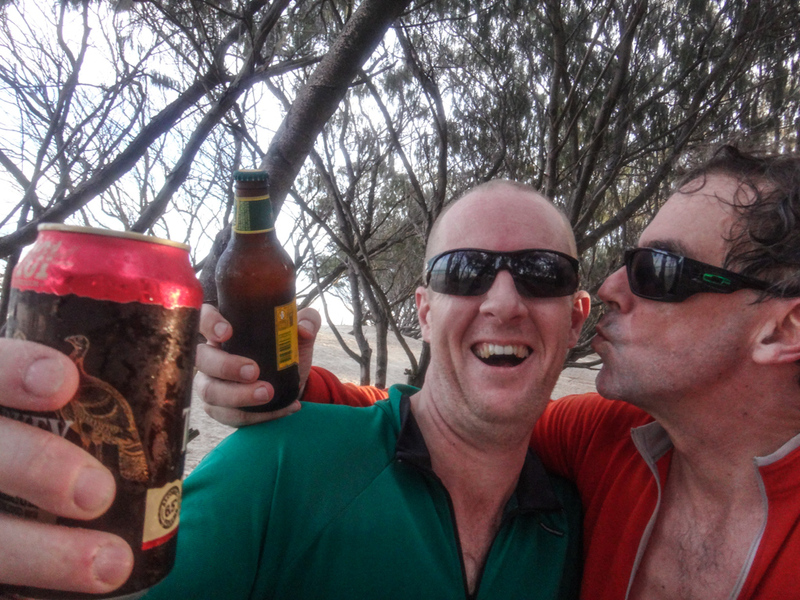 Adam invited me to go camping with him on North Stradbroke Island (“Straddie”). There was only one condition: we had to complete the entire trip within a twenty-four-hour window. 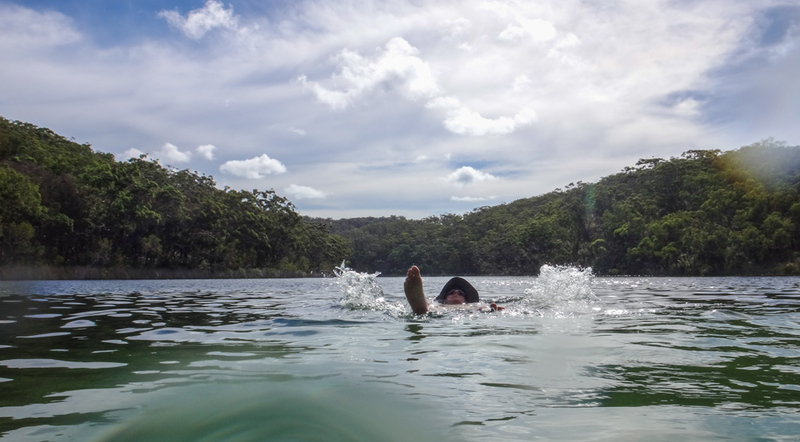 It’s called a “Sub 24 Hour” adventure – proving that even busy people can afford the time to have fun. 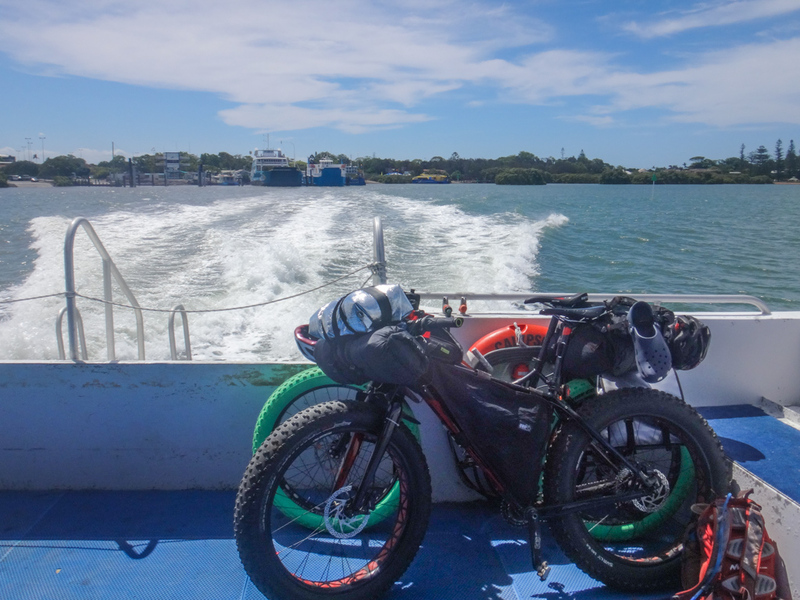 So that afternoon, we rolled the bikes onto the water taxi at Cleveland and set sail for one of the largest sand islands in the world. 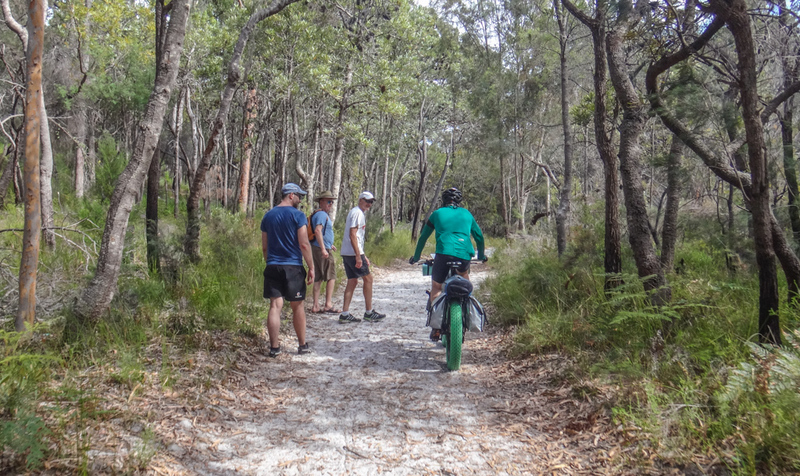 Even though we would only be staying for one night, our bikes were still heavy. 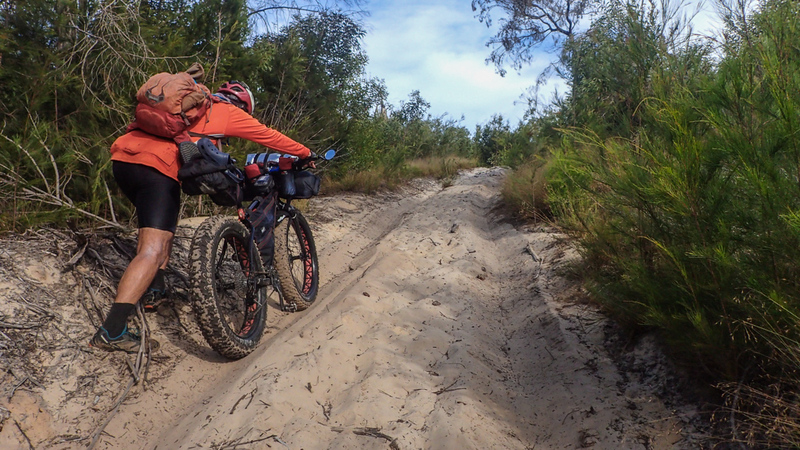 Adam is preparing for a multi-day trip on the Tasmanian Trail and wanted to test out his gear. It’s hard work climbing hills on a heavy bike. 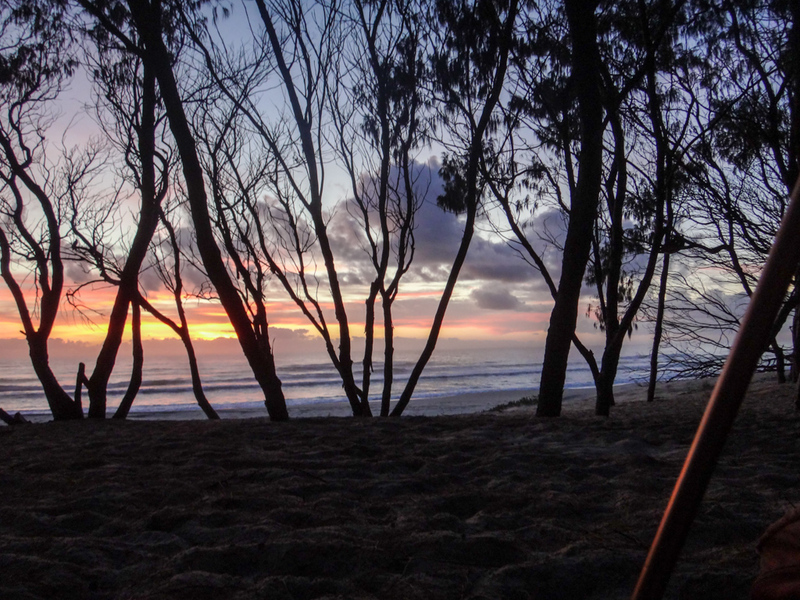 I had no excuse – I always pack too much gear, even for one night. 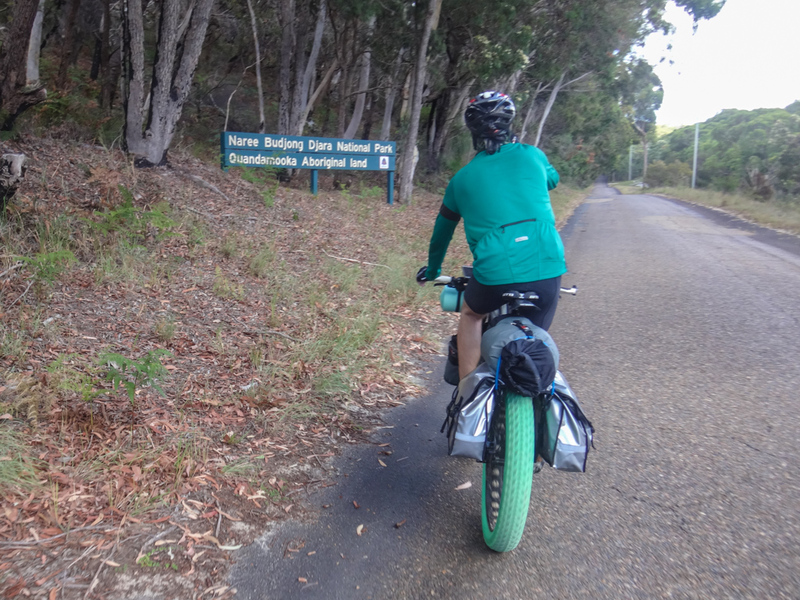 But the fat bike had nice low gears, allowing me to slowly grind along the hilly road that crosses the island from east to west. 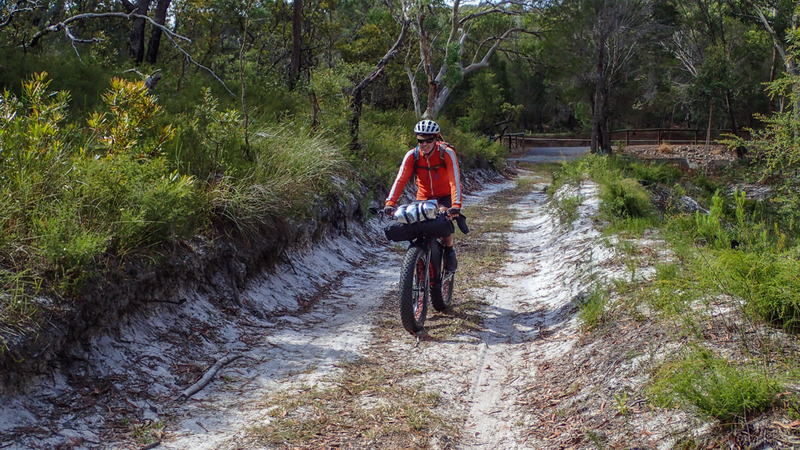 Eventually, we left the paved road for a sandy fire trail. 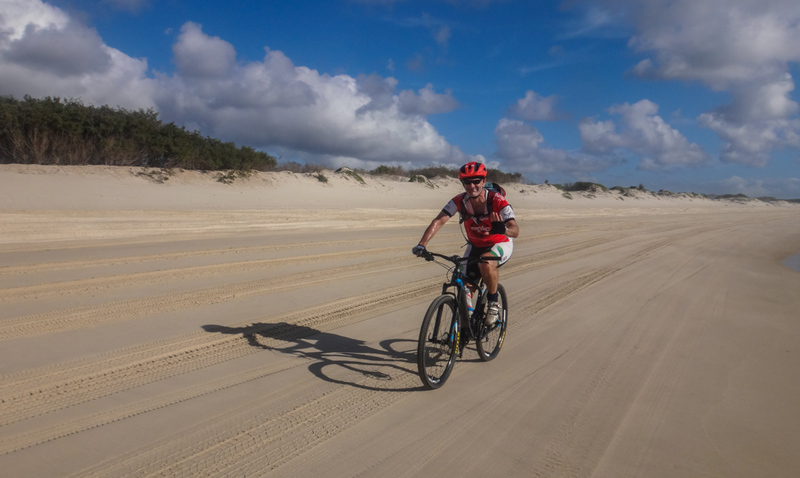 Tyre width and pressure make a big difference when riding over sand. My 5-inch tyres are inflated to about 7 PSI and float over most surfaces. 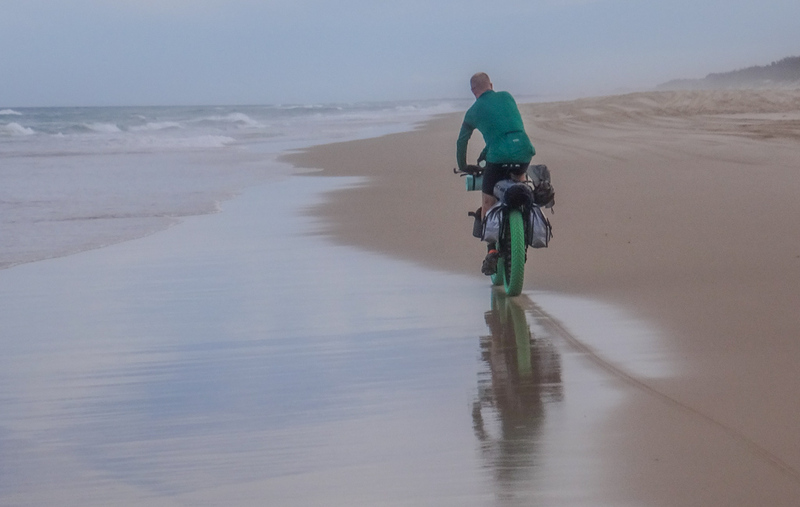 Adam’s narrower 4-inch tyres were inflated to a higher pressure, which slowed him down on the sand. He soon needed to let some air out. 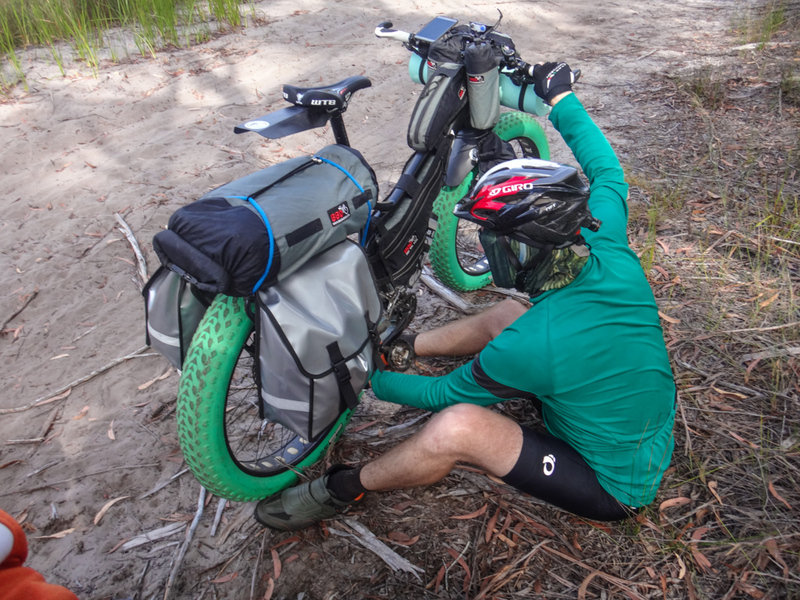 It’s easier to let air out of a fat bike tyre than it is to put air into it. When we reached Blue Lake we removed most of our gear and jumped in. The clear cool water was delicious on our skin. We splashed around for half an hour enjoying the respite from the heat. As we continued our ride, a creek blocked our track. 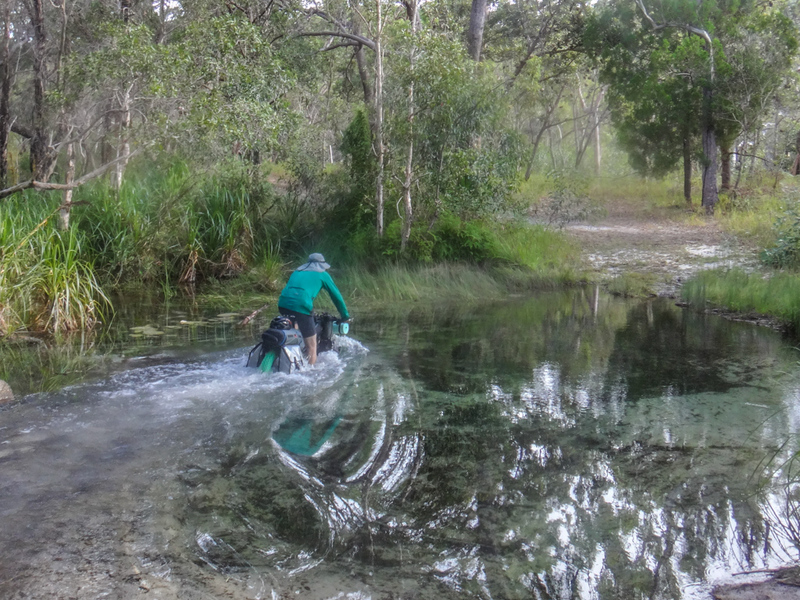 His bike almost disappeared under the water, but somehow he managed to ride through the creek and out the other side. I played it safe and carried my bike through. 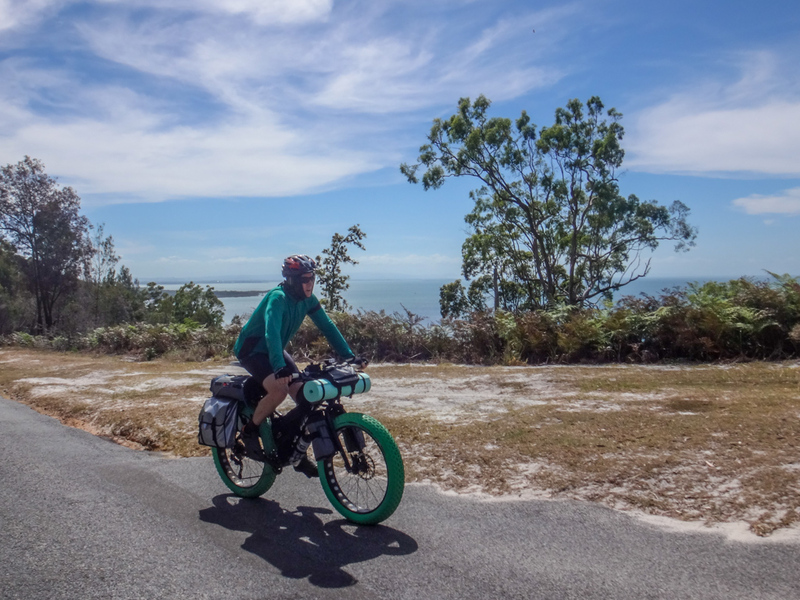 The large tyres buoyed up the bike – it almost floated on the water. My shoes were saturated from walking through the creek. 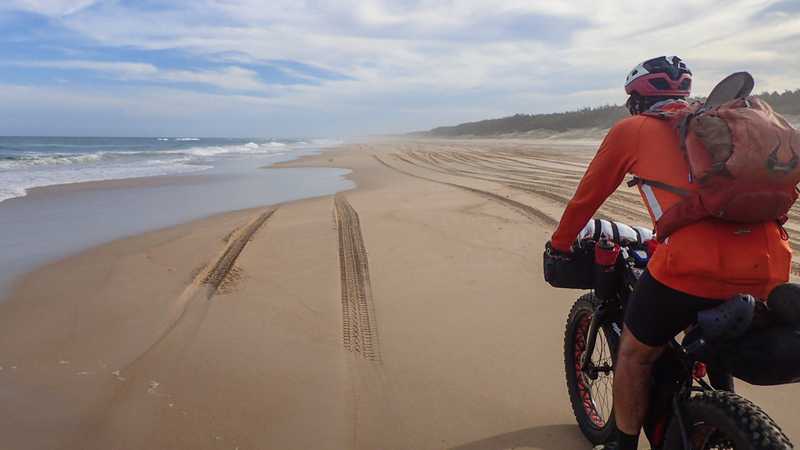 At the next steep sandy hill, I pushed the bike while trying not to coat my wet shoes with sand. 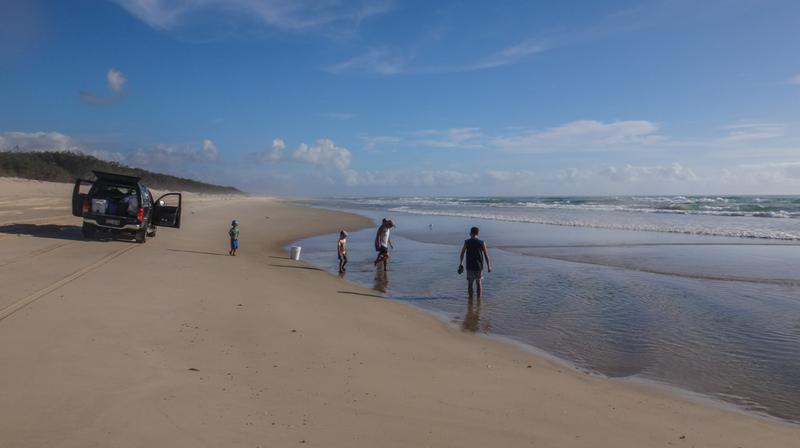 Straddie has a long thin freshwater swamp which sits behind the dunes on the eastern side of the island. The Eighteen Mile Swamp is the largest freshwater swamp of its kind in the world. 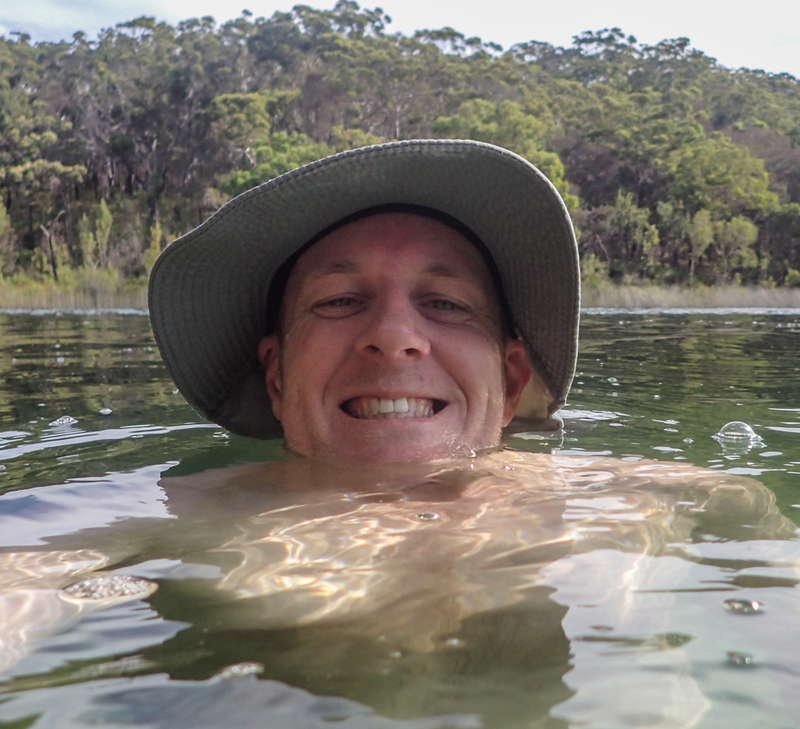 The water is crystal clear and provides habitat for several endangered species. There’s a legend that the ruins of a Spanish Galleon are hidden somewhere in the swamp. We didn’t find a ship, and we swore an oath to secrecy about the golden doubloons that we (may or may not have) found. The hiss of waves grew louder as we neared the beach. 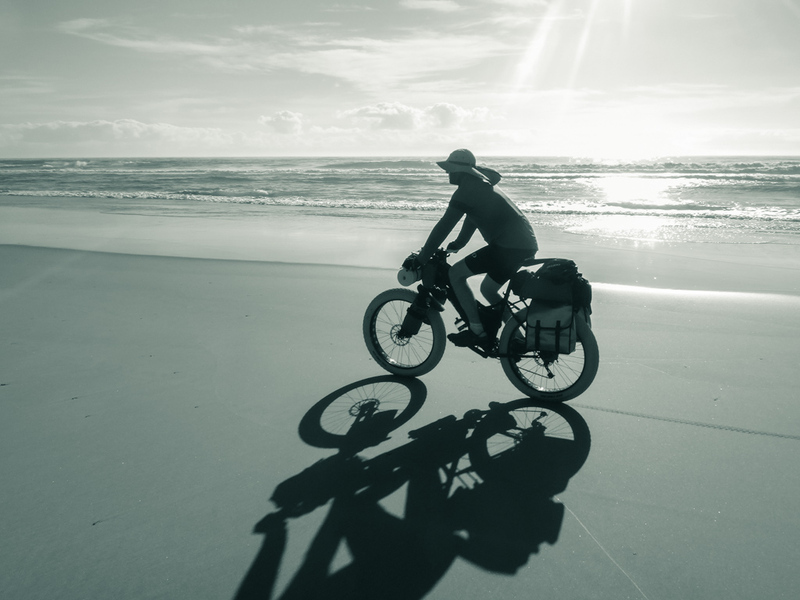 We had timed our ride to arrive on the beach three hours before the low tide. 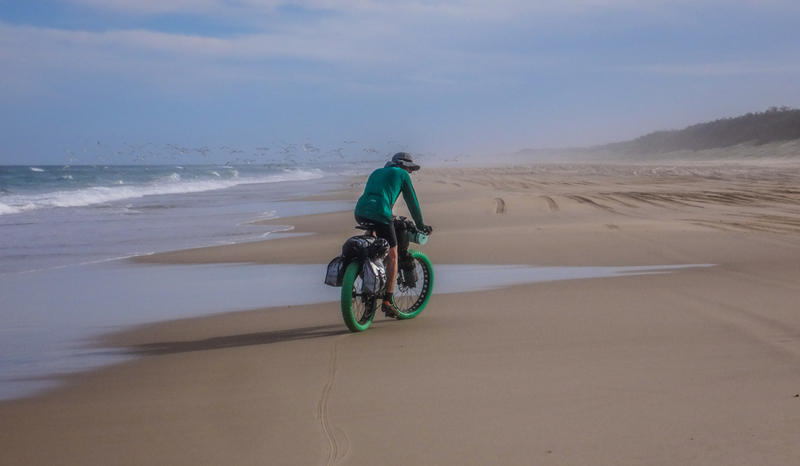 The sand was still soft and difficult to ride on. 4WD’s had left deep ruts. 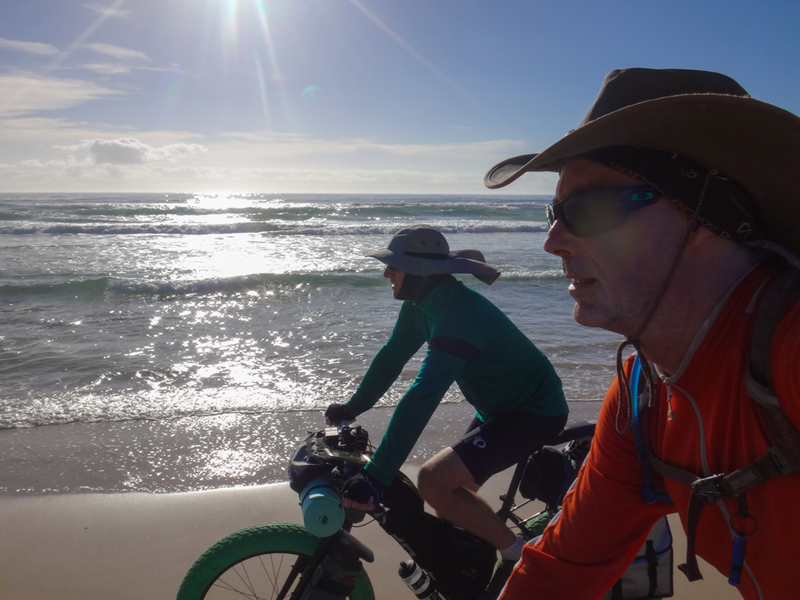 We didn’t mind pedalling strenuously on the wet sand. The tide was falling so the surface would get firmer as we progressed. 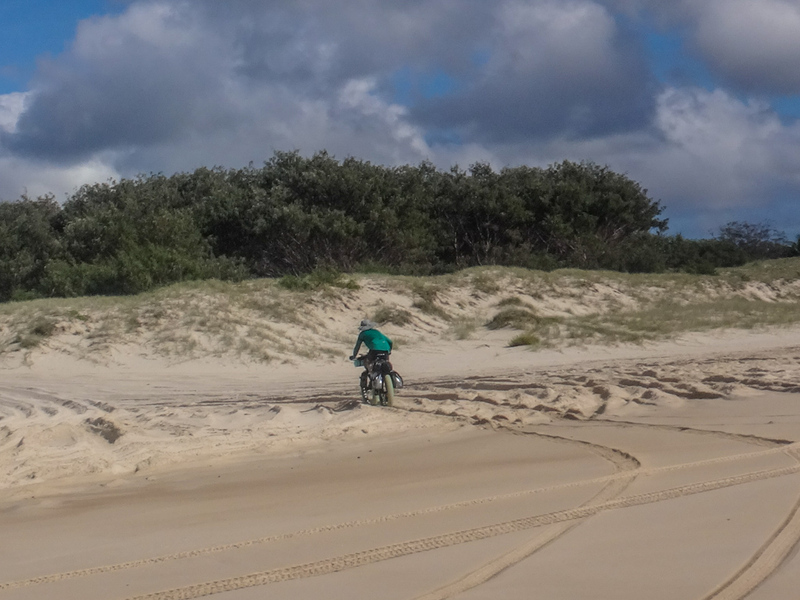 Apart from the odd 4WD, the beach was deserted. Large flocks of Silver Gulls and Oyster Catchers scattered as we rode through them. The beach was endless. 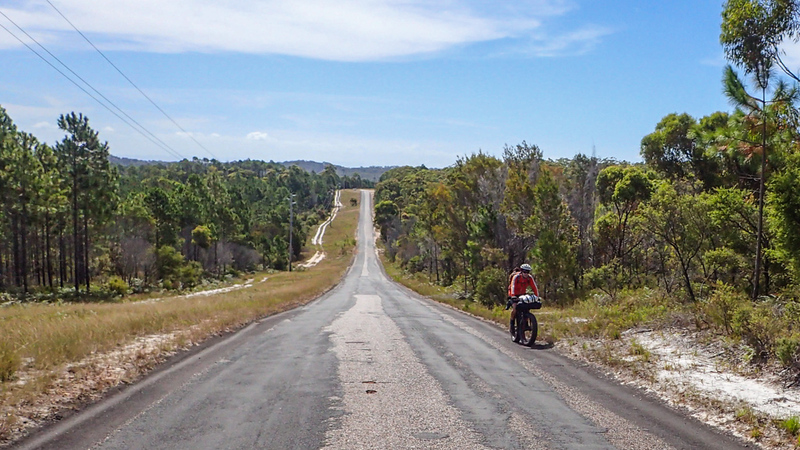 We had planned to ride to “Jumpinpin”, at the southern tip, but I didn’t realise how far that was. As the sun sank lower in the sky it became obvious that we wouldn’t reach our intended campsite before dark. Adam and I agreed to look for a closer campsite. 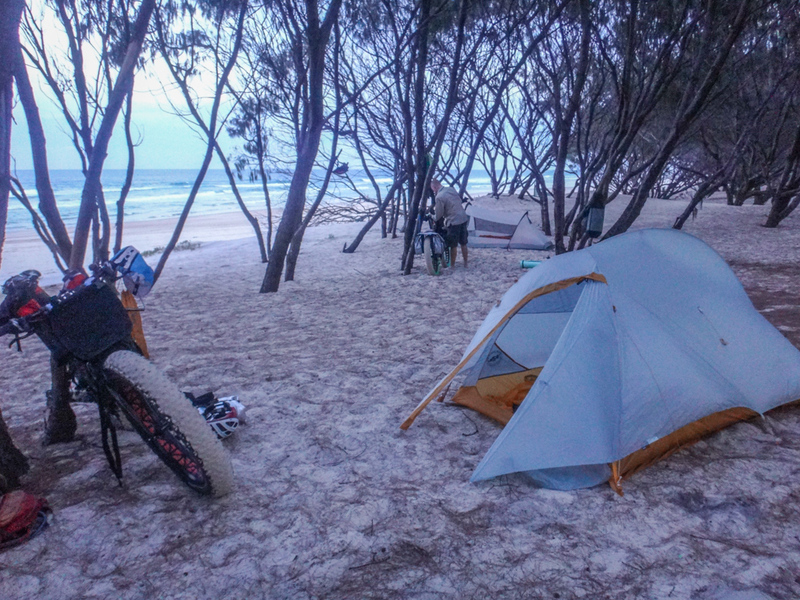 That way we could pitch our tents while it was still light, then continue exploring the beach on our unloaded bikes using our headlights. I left Adam on the beach while I looked for a suitable spot in the dunes. Eventually, we found a quiet spot in the shade of the trees and set up camp. 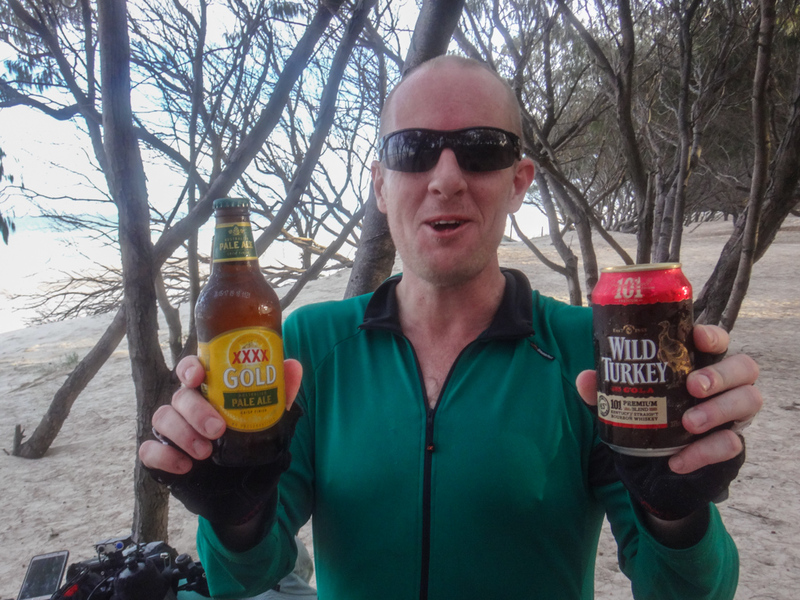 With a mischievous look, Adam reached into his ice-filled panniers and pulled out a cold beer for me. I hugged him enthusiastically before we both cracked open the drinks, sat in the dunes, and watched the remainder of the day slowly fade. 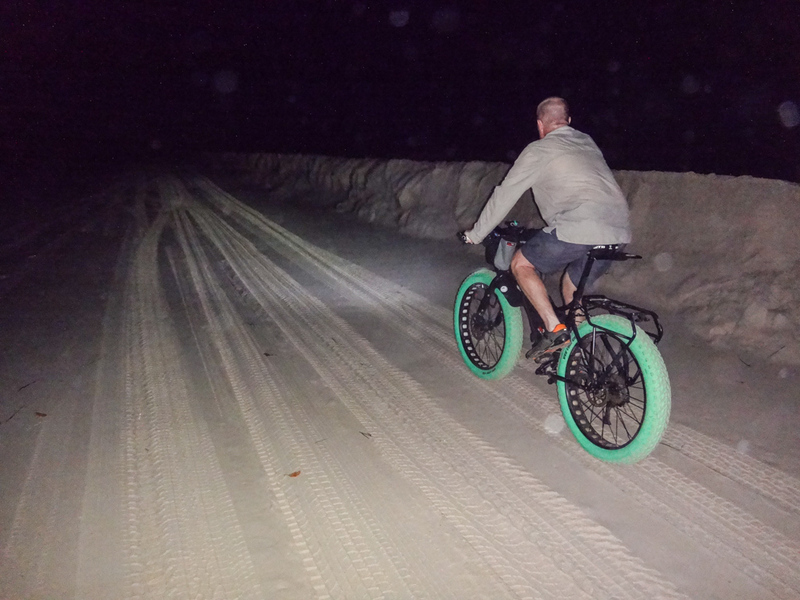 After dinner, with our unloaded bikes lighter than earlier in the day, we turned on our headlights and rode down the dark beach. A blue light twinkled in the water. 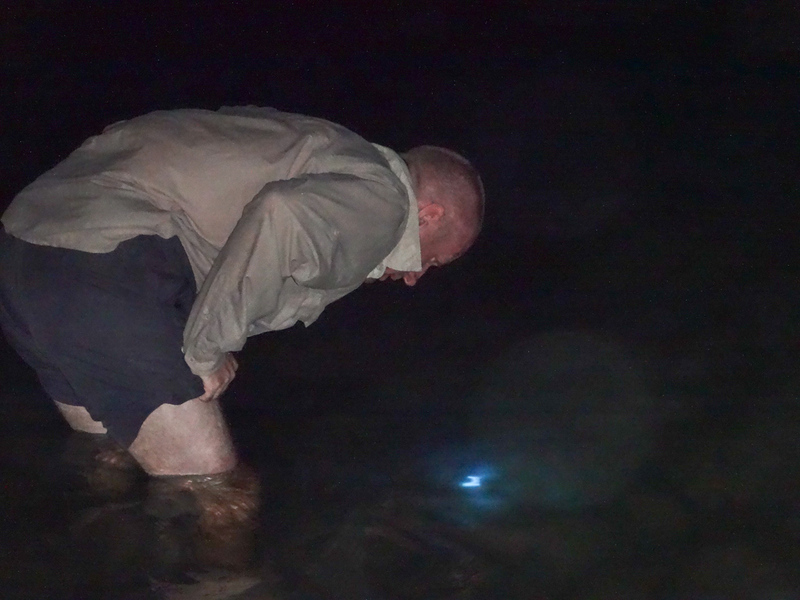 I was wrong on two counts: the water didn’t phosphoresce. and it wasn’t a fish. It was a rod light. 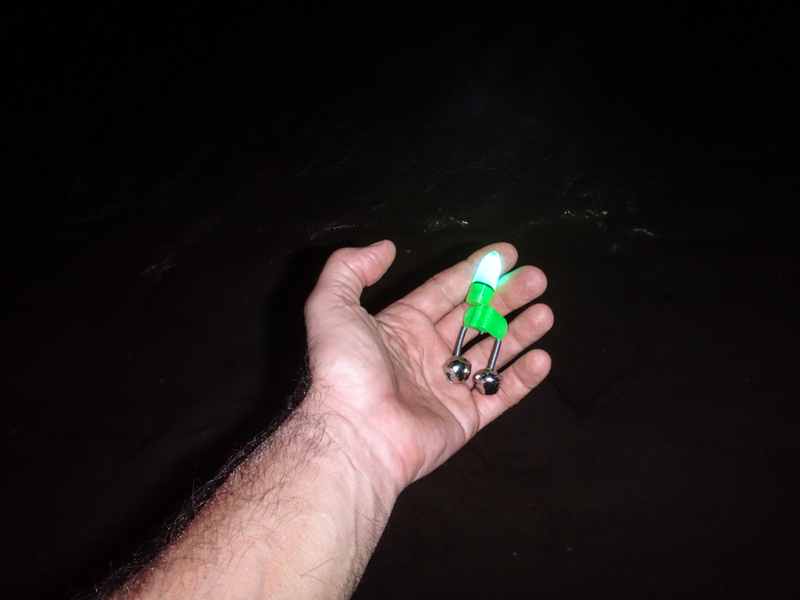 (I didn’t even know such a thing existed) You put it on the end of your fishing rod at night so that you can tell when a fish tugs at the line and bends the rod. This light had fallen from the end of someone’s rod. We neared the southern tip of the island. Large drop-offs in the sand would make it impossible to come this way at a higher tide. If we stayed here too long we’d be stuck. 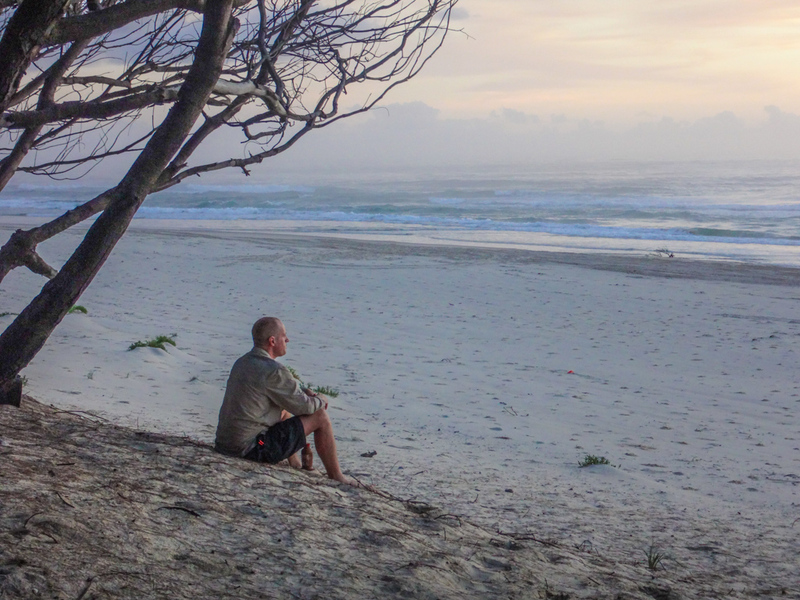 A laconic voice called out of the darkness from behind a fire on the beach. The beach stopped here. We could go no further. A group of relaxed campers looked at us with amusement. 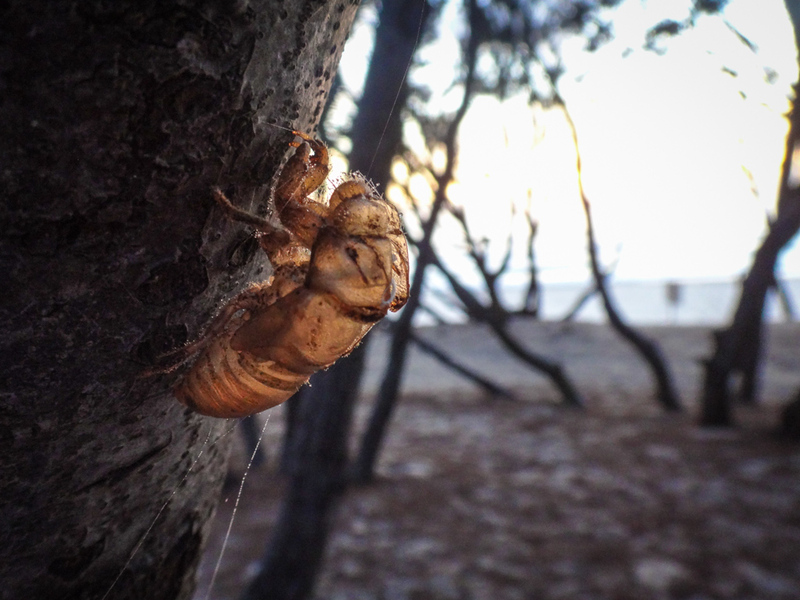 They didn’t bother with tents – they all just had swags and would sleep under the stars. 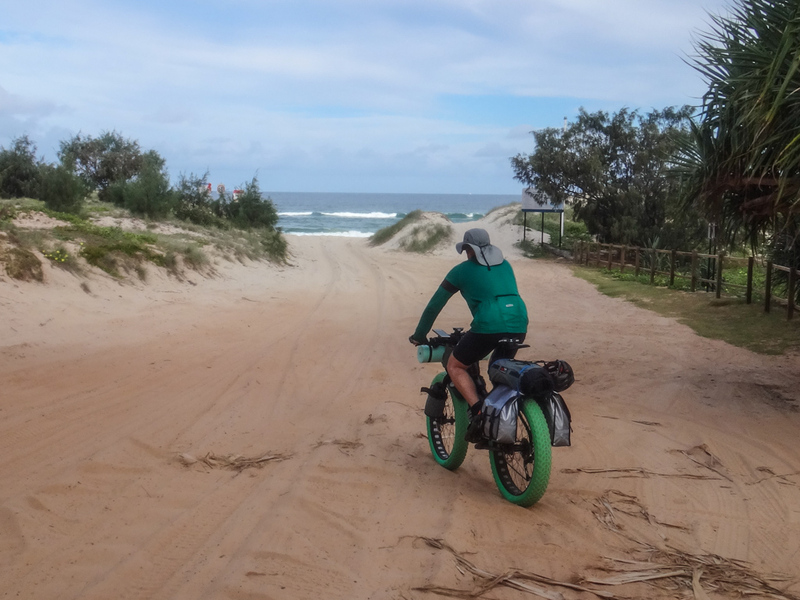 We chatted a while about the bikes, and about how much we liked Straddie. But the tide had turned, and would soon be rising. We needed to return to our camping spot before we were cut off. It took us about an hour, but we eventually made it back to our campsite and slept soundly after a huge day. I woke before dawn as the early light crept over the horizon. 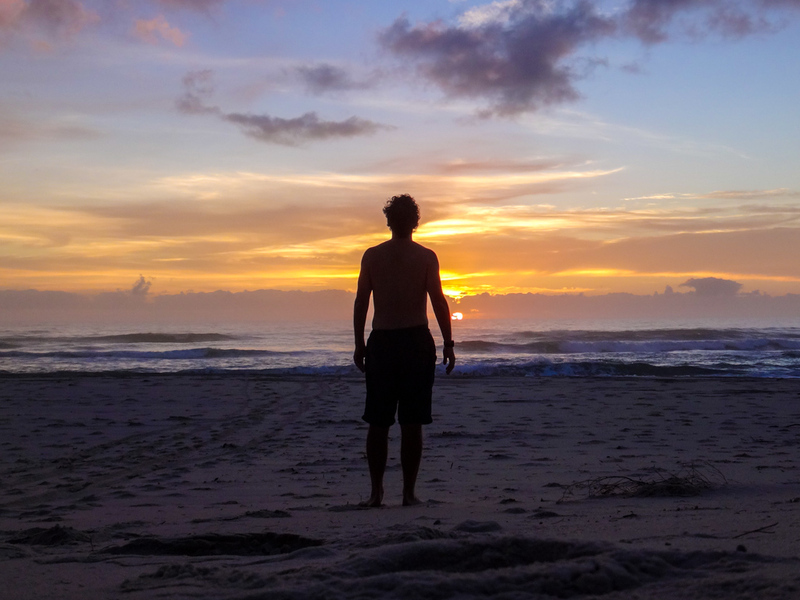 There’s something magical about the beach before dawn. In the cool air, a slight mist rolled in from the sea. This is good for the soul. If I can do this at least once a year for the rest of my life I will be happy. We soaked it up. This is what we came for. The golden light made everything look special. By the time we had finished breakfast and packed the bikes, the midsummer sun was hot again. 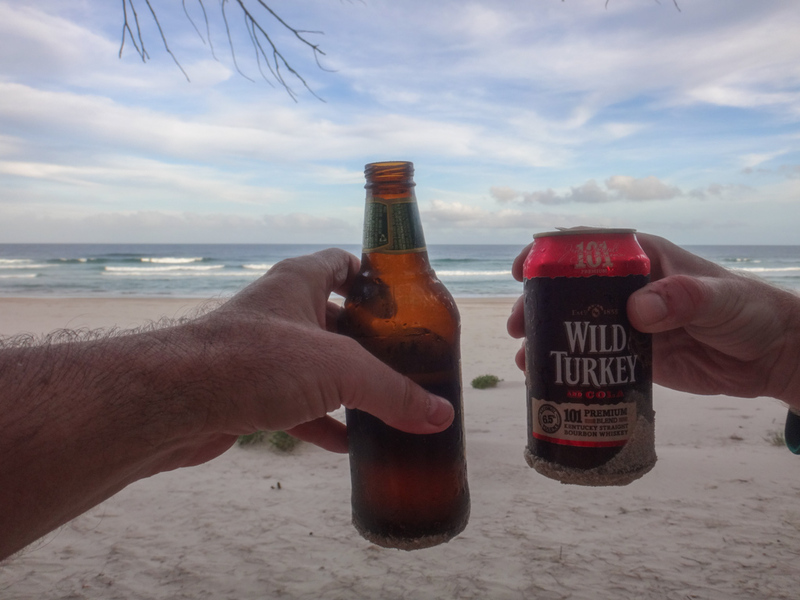 We made our way back up the beach. 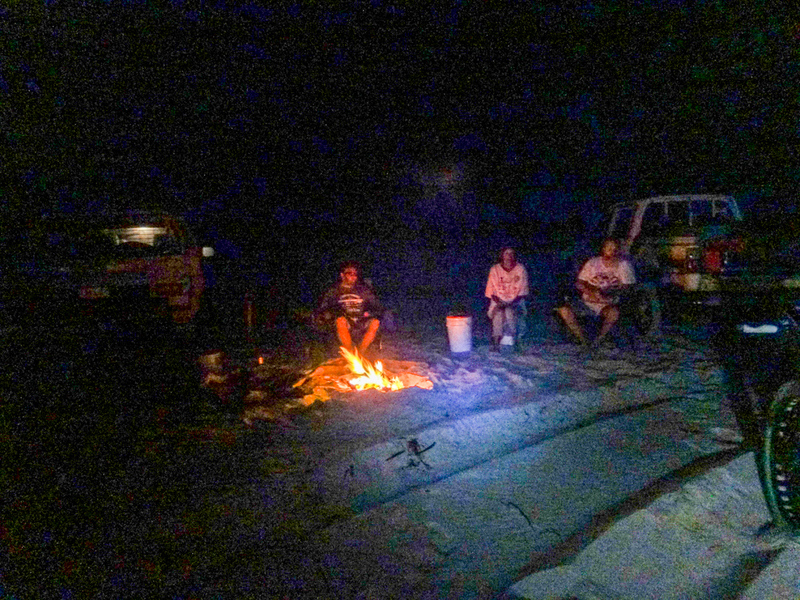 There were several campers by the water along the way, but for most of the trip we had the beach to ourselves. Unlike yesterday, the beach was wide and firm. With a slight headwind to cool us, we enjoyed an easy ride. Another mountain biker waved as he zipped past us on his skinny tyres. 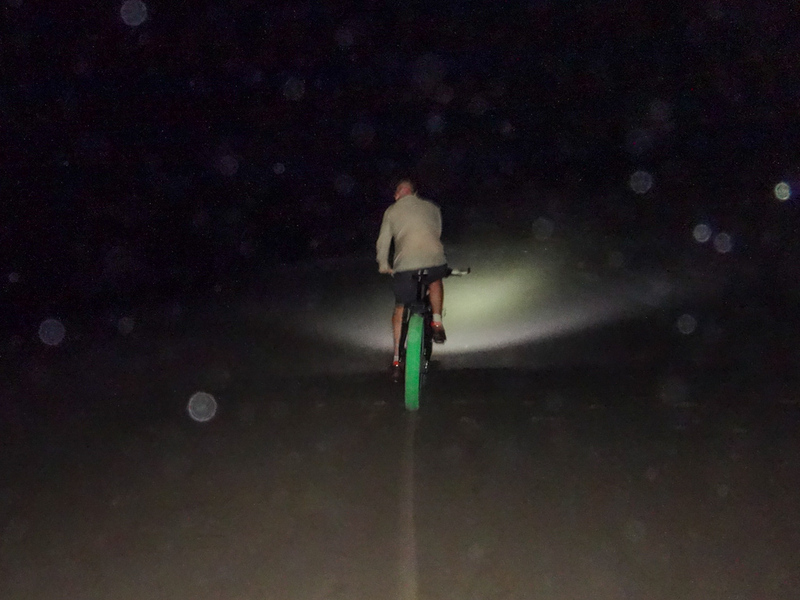 After about an hour we reached the beach exit and dragged the bikes over the soft sand. This is Quandamooka country. 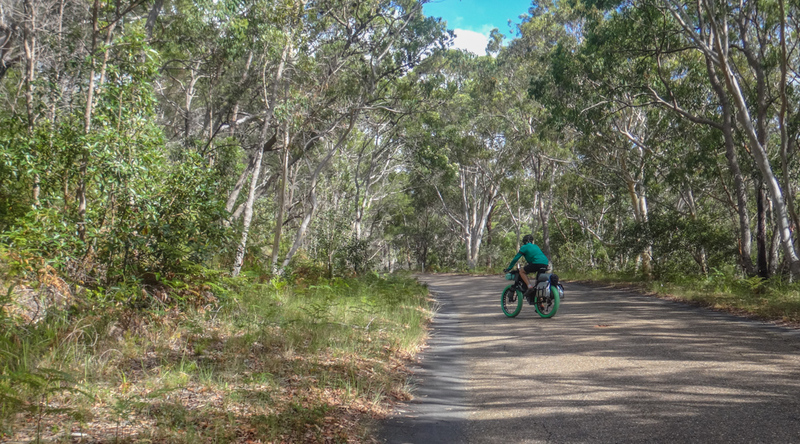 The traditional indigenous owners named the national park “Naree Budjong Djara” which means “My Mother Earth” in their language. We slowly made our way up numerous hills along the Trans-Island Road. The day grew hotter. My legs felt tired. This was hard work. 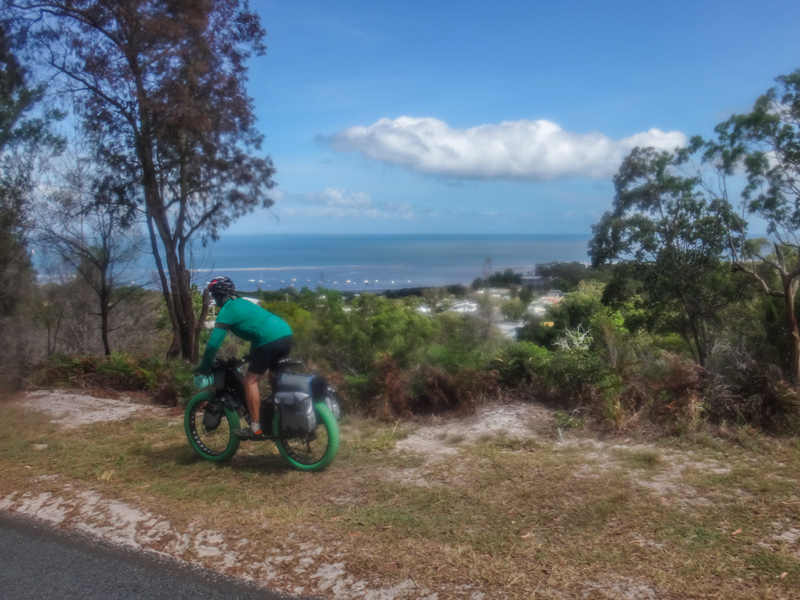 At the top of the last hill of the day, we enjoyed a good view of Dunwich and the turquoise water of Moreton Bay. 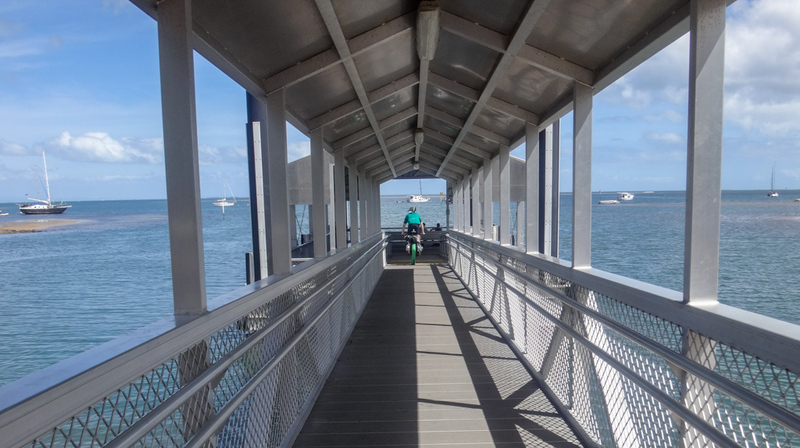 We’d made it with time to spare, and cooled off in the breeze as we waited for the water taxi to arrive. 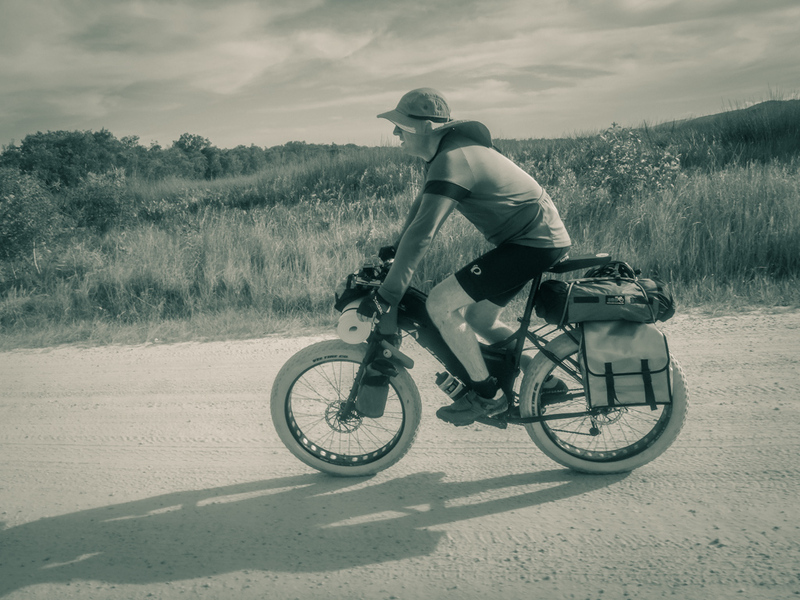 In three separate segments, we rode a total of about 80 kilometres in about nine hours. During that time we climbed about 520 metres in elevation and I burned about 4,000 kcal. In this hot weather, and with heavy bikes this was a moderate challenge. I’ll rate it 7.5 out of 10 on the tough-o-meter. This is a magical ride in beautiful country. 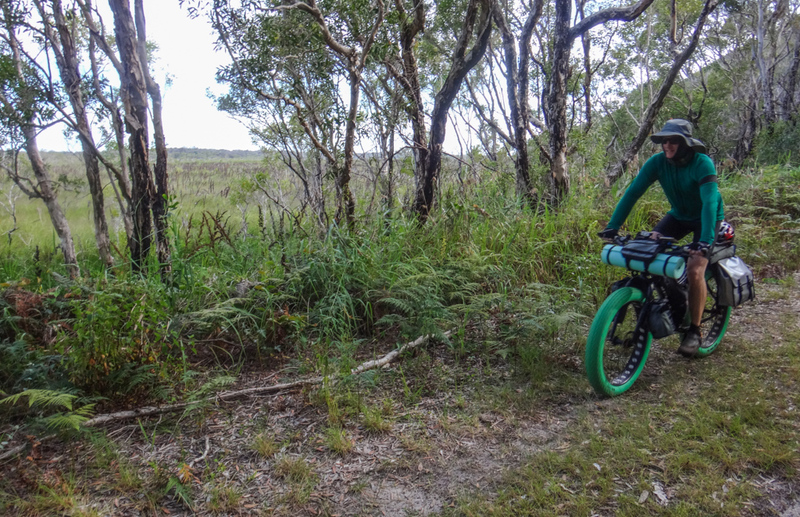 A fat bike and tent are perfect for exploring Straddie. Thanks, Adam, for inviting me on such an enjoyable trip. There is an intermittent problem with Garmin Connect on Firefox browsers. It doesn’t display the track log. I’ll sort it out asap. Thanks for the heads up.